When my (and everyone else's) ancestors first migrated out of Africa around 60,000 years ago, they were not alone. At that time, at least two other species of hominid cousins walked the Europe/Asia landmass - the Neanderthals and Denisovans. 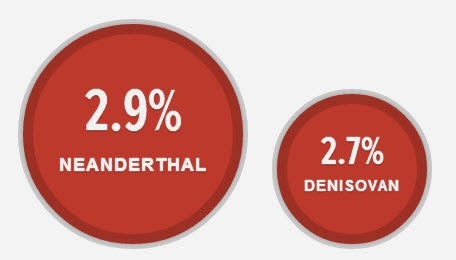 Most non-Africans are about 2% Neanderthal - according to the Genographic Project I am 2.9% Neanderthal and 2.7% Denisovan! Everyone living outside of Africa today has a small amount of Neanderthal in them, carried as a living relic of these ancient encounters. A team of scientists comparing the full genomes of the two species concluded that most Europeans and Asians have between 1 to 4 percent Neanderthal DNA. Indigenous sub-Saharan Africans have no Neanderthal DNA because their ancestors did not migrate through Eurasia. According to a report by John von Radowitz in today's Irish Independent Cavemen died out 'as they bred with early humans', Neanderthals "are often depicted as dim-witted evolutionary losers, but Neanderthals were not driven to extinction by their lack of brains" and that it is "likely that they disappeared 40,000 years ago due to interbreeding and assimilation with early human ancestors". So there's a thought - I am 2.9% "caveman" because one of my ancestors shagged a Neanderthal!